We have made no progress in stopping the microbe. Our biologists are now simply calling it the “Blight.” Our focus must be on completing our starship and escaping the planet. 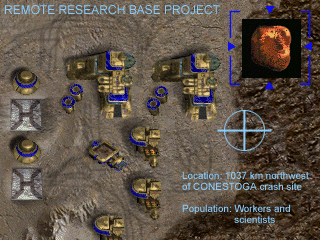 Computer projections show that at the current growth rate of the Blight we will barely be able to complete the research, produce enough metals, and build the starship in time. Some of the richest ore deposits on New Terra have either been infected or are now in extremely dangerous volcanic and seismic regions. We must move carefully ahead of the Blight and use all of the available resources possible to survive. Instruments indicate the atmosphere on New Terra is continuing to thicken and our planetary scientists predict more unusual disturbances. New Terra, it seems, is beginning to have weather. We have constructed a special base with some brave volunteers in one of these dangerous areas. This base combines both mining and research facilities in close proximity to make our space program progress more efficiently without jeopardizing the rest of our colony. We must increase our research results and metals production to continue our starship program. We should soon be able to begin sending launch vehicles into orbit and constructing the starship. A few ConVecs and other vehicles are all we can risk in this area. Use the Spiders and EMP's to capture units and reinforce our own defenses to conserve the valuable metals we are producing. Build more vehicles at the Vehicle Factory if you absolutely need them, but you must manage without a Structure Factory. After our last encounter with Eden they must surely suspect our plans. Based on their reaction so far, they will probably try to hinder our efforts. Be prepared for any attacks Eden may launch on our base. Our needs are critical. See the Specific Objectives list for the things we must do to complete our starship in time to save our colony. Completely research the Space Program. Have 10000 units of Common Metals. Have 7500 units of Rare Metals.